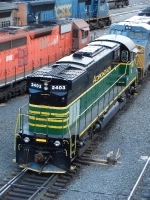 Description: Freshly painted Alco 4243. 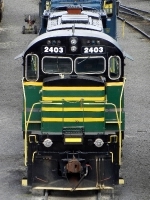 This Alco has been sold to the Delaware-Lackawanna RR of Scranton, Pa., renumbered as DL 2403, and will be running on the DL tracks sometime in 2012! Description: Thendara Yard shot. 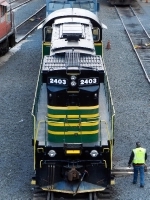 This engine going to Delaware-Lackawanna in 2012 as DL 2403. Description: DL ALCO C424 2403 trails EB into Selkirk. Title: A pair of Century series ALCOs heads East, light power. Description: New kid in town! Glad I shot it here, they left it & 2461 behind!